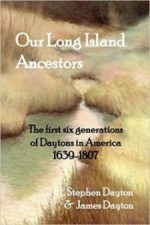 In the next few days, we’ll be placing our book, Our Long Island Ancestors, the First Six Generations of Daytons in America 1639 to 1807, online in a free format. We plan to make it available at archive.org. Please use discretion when copying passages from the book. We have written the copyright usage parameters on page ii of the book. You can still purchase paper copies at Amazon.com. Our purpose in making it available in free PDF format is so Dayton researchers can gain easier access to its contents. This entry was posted in Abraham Dayton, Alice Dayton, Ann Francis, Anne Frances, Ashford, Daiton, Datton, David Dayton, Dayghton, Deighton, Dyghton, Haines, Henry Dayton, Medlen, Medlin, Ralph Dayton, Robert Dayton, Samuel Dayton, William Deighton and tagged Abigail Norton, Abraham Dayton, Alice Tritton, David Dayton, Elizabeth Beardsley, Henry Dayton, Medlen Dayton, Medlin Dayton, Our Long Island Ancestors, Ralph Dayton, Samuel Dayton. Bookmark the permalink.